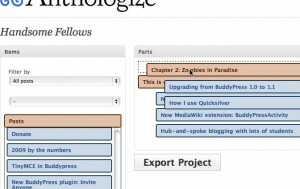 The product of One Week | One Tool, a one week digital humanities tool barn raising hosted by CHNM and sponsored by the NEH Office of Digital Humanities, is Anthologize. 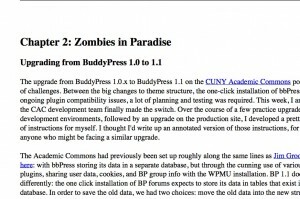 Anthologize is a WordPress plugin that lets you collect and curate content, organize and edit it into a form that works for you, and publish it in one of a number of ebook formats. As I said in my last post, I was the lead developer for Anthologize. This stemmed from the fact that, for reasons of market penetration and ease of use, we’d chosen WordPress as a platform, and I was “the WordPress guy”. As such, I was the natural person to oversee the various parts of the development process, and to make sure that they fit together in a neat WordPress plugin package. It was an incredible and humbling experience to work with a group of developers who were, to a person, more talented and experienced than I am. Today, the plugin is shipping with four different formats for exporting: PDF, ePub, RTF, and a modified version of TEI that leaves most content in HTML form. None of these export processes are perfect. Some require that certain libraries be installed on your server; some do not offer the kind of layout flexibility that we like; some are not great at text encoding; etc. This release is truly an alpha, a proof-of-concept. The goal is to show not only what a group of devoted individuals can conceive and develop in six short days, but also to provide the framework for further development in the world of independent authorship, publishing, and distribution. As such, the plugin is designed, and will continue to be developed, with an eye toward maximum flexibility and modularity. Content can be created in WordPress or pulled in by RSS feeds, providing for greater choice of authoring platform. Export formats are generated by translators that work not with native WordPress data, but with an intermediary layer structured with TEI metadata markup. That means that you don’t have to know anything about WordPress to build a new export translator for yourself – you only have to know some PHP and XSLT. And we’re working on expanding Anthologize’s action and filter hooks to allow for true pluggability in the manner of WordPress itself. 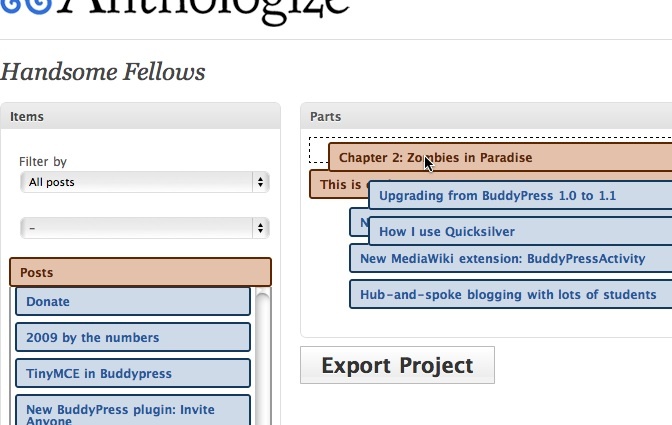 I’m hoping that Anthologize will be a useful tool that draws development interest from folks who might not otherwise be interested in WordPress or web development, especially those who are working in the academic, cultural heritage, and digital humanities worlds. Get involved by checking out our Github repository at http://github.com/chnm/anthologize, our development list at http://groups.google.com/group/anthologize-dev, or stop in and chat with the dev team at #oneweek or #anthologize-dev on freenode. Date: August 3, 2010 · Author: Boone Gorges.